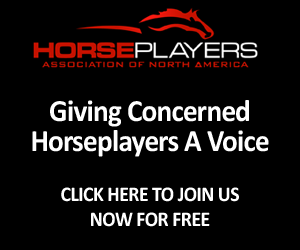 Horseplayers Association of North America: What's Up With This? We see East v West in many things in this sport, and have for years, but on doing racings business it is rare to see execs throw a salvo out at other execs. We all know takeout is going to increase 10-15% in CA (2-3% increase on exotics). 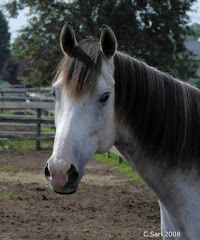 We have read cali racing say that they think raising it is a good policy to grow purses. 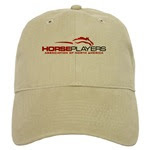 Horseplayers and many industry watchers let their thoughts be known. "Duncker noted the blended rates in New York were 15% in 1960, 17% in 1970, and 19.81% in 2010. 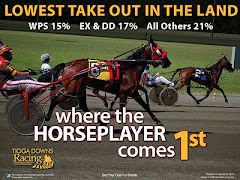 Over that period, racing has faced growing competition from other forms of gambling that employ takeout rates of 2%-10%. OK, maybe just an aberration, huh? Coincidence? Just today on CNBC, NYRA Pres Charles Hayward comes out saying the same thing Duncker says, live on camera (click here for video). When asked about why horse racing is down, he said "in 1960 our takeout was 15% and today its 19.8%. The industry has to look at the financial side and make it a better value proposition. 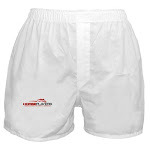 We are taking too much out of the customers pocket. It is not competitive. A reduction of takeout would be more beneficial for us"
This prompted the opposite reaction from players. 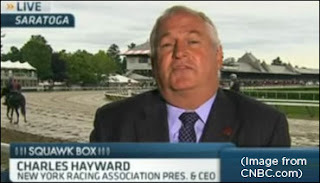 For example, New York player Ernie Dahlman, who almost never posts on the web said "It is great to hear that NYRA's CEO Charles Hayward "gets" that racing has a problem with excessive takeout. That alone puts him in the upper 1% of racetrack executives." Our question: What do players think is going on here? I have absolutely no inside information on this, so the following is pure speculation. One possibility: now that it looks like we're really going to get some slots revenue in NY, perhaps NYRA is feeling a little more free to try some experiments and see if handle really is price-sensitive. NYRA's signal is the most important in the industry; if a pricing experiment works there, it would be big news. Steve Duncker and Charlie Hayward are botrh smart guys. Perhaps they've managed to break through the lore that seems to dominate most racing industry decisions and substitute fact- and figure-based analysis. If so, they deserve congratulations. I firmly believe that solid handicapping principles are easily applied to any surface, so the synthetic issue is a complete non-factor in my determination of where to invest. In fact, if most good handicappers would use their time currently put toward complaining about synthetics into studying, there is ample money to be made. With that said, the combination of a surface that people seem opposed to embracing, a complete debacle called Oak Tree, and short fields, California was already up against it. If they pass a bill to increase takeout, my handle toward that state will drop to zero. 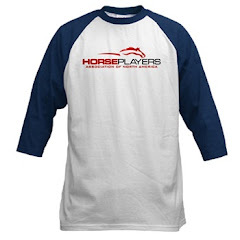 Exchange wagering could very well be the single best innovation for the U.S. horseplayer to ever come around. I have no confidence in most track level executives to thoughtfully introduce this powerful tool in a meaningful or business way. In most cases, we're dealing with a bunch of dinosaurs with nary a care about their customers. While encouraged by Hayward's comments, I'm not holding my breath for anything meaningful to come of it. The powers that be in CA ought to ask themselves a very simple question: What does 2% more of nothing equal?